Early on, we began coaching the fellows before their demonstrations, and as a result, the overall quality of the demonstrations improved immeasurably. After a few summer institutes, we realized we were learning some things about successful teacher demonstrations, and we decided to share what we knew rather than set our fellows free to learn entirely from their own mistakes. In fact, some teachers had never done anything like this before. During the coaching sessions, directors and former fellows listened to what the teachers were planning for their demonstrations. I would listen for what I learned were the most successful elements: Is it focused on one idea or approach? How will the audience be involved? Will there be time for discussion? Will it be clear to the audience why the teacher is demonstrating this particular practice? Before coaching, teachers frequently tried to do too much, or spent too much time introducing what they were going to do, or left little time for involvement or discussion. All of these problems could be anticipated in a coaching session and nipped in the bud. Looking back now, I realize how unfair it was during the first summer institutes, before we instituted coaching, to ask teachers to give an exemplary demonstration when they had little understanding of what was expected. For example, coaching would have helped the teacher who gave a lecture on English sentence patterns culled from several different textbooks, which contradicted one another. For her demonstration, the teacher put together a handout of all the twenty-three basic sentence patterns she had found in the texts, then she read and described them to us one by one. After this lecture, the teachers sat stupefied in their chairs: not one question was asked; not one comment was raised. Teachers who have knowledge of sentence patterns are well positioned to help their students as they struggle with sentences, but these teachers learned little about the subject that day. Because we had not coached the teacher, an opportunity was squandered. Today, the entire process of the demonstrations–planning and conducting a trial-run workshop and observing, evaluating, and participating in other teachers’ workshops–begins to prepare fellows to become writing project teacher-consultants. For the BAWP staff, the demonstrations help identify the teacher-consultants who are ready to conduct workshops in the schools. Those who conduct excellent workshops are put to work as soon as possible in the follow-up school-year programs. Others are worked in more gradually after they’ve had time and opportunity to sharpen their presentations. BAWP also holds monthly Saturday meetings open to the public that give teachers the opportunity to become comfortable as presenters. But from the start, we wanted to give teachers other opportunities to work with their colleagues in the project, since we knew that highly successful teachers of young people could feel uneasy or ill prepared to teach teachers. Some teachers would never be used, and some would opt out on their own when they discovered that they just didn’t like giving workshops. One thing I learned early on while watching teachers demonstrate their best practices to other teachers was how much these already successful teachers could learn from one another. Initially, I thought only of preparing these teachers to teach others and gave little thought to how much they too wanted to learn how to be better teachers. In the institute, even our strongest teachers seemed to realize they had a grasp on only a piece of what was known about the teaching of writing. In the large and expanding field of written composition, they taught specific things very well indeed, but in the summer institute, they learned more and stretched their abilities, both through their summer institute reading and by participating in the demonstrations of other teachers, who showed them new skills and approaches to teaching writing. Another important point needs to be made about the nature of the demonstrations. Institute teachers themselves determine the content of their workshops. I would tell them to pick their best shot. This freedom has important implications for the way the writing project works. By allowing excellent teachers the opportunity to demonstrate their best practices without restrictions, the project remains open to new ideas, approaches, and variations. This open mindset keeps us from ever saying, “This is it! This is the Bay Area Writing Project approach to the teaching of writing!” The writing project is not a writing curriculum or even a collection of best strategies; it is a structure that makes it possible for exemplary teachers to share with other teachers ideas that work. Yet at the same time, over the lifetime of the project, certain ideas and approaches have risen to the top like cream in an old-fashioned milk bottle: the importance of teaching writing as a process, the importance of paying attention to all stages within that process, the ways in which writing can promote learning, the need to have students experience a wide range of writing experiences, the need to begin writing instruction in the early primary grades and to keep attending to it throughout schooling. While these are some of the ideas writing project teachers promote–ideas that at times are identified with the project, locally and nationwide–the writing project has always remained open to whatever approaches work, from whatever source. The net will continue to be cast. 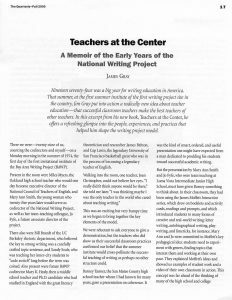 Above all, the writing project honors teacher knowledge, knowledge that can come only from the practice of teaching writing. When classroom teachers are respected and recognized for what they know, when they are treated as the experts they are, they gain strength and become less defensive and more open. Such an atmosphere of trust encourages honest dialogue and a breaking down of traditional barriers between universities and schools, and as a result, teachers from both settings can begin working together as mutually respected colleagues.